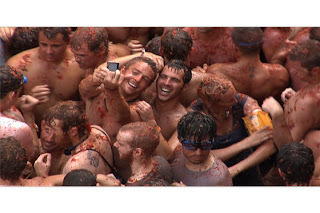 This Wednesday (Aug 25, 2010) in a small town of 9,000 people called Buñol just a 45 minute train ride from Valencia, Spain is the famous La Tomatina festival. I was at this crazy festival last year and hope to go again in the future. From my trip I learned a few key tips for successfully enjoying this festival and have listed them below. On the last August of every Wednesday 40,000+ people show up in the small town of Buñol for this festival. In the street there is a large lard and grease covered pole with a ham at the very top that the masses of people have one hour to climb to claim their prize of the ham and signal the tomato fight to begin. (often people can’t reach the ham) If the ham is not retrieved the tomato fight still begins at 11am. 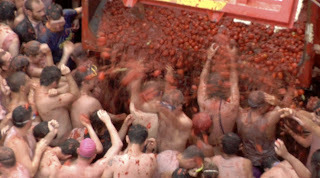 A loud speaker announces to the crowd in various languages that the fight has begun and many dump trucks full of tomatoes drive through the small streets dumping thousands of tomatos (spoils from the harvest) into the street and for an hour the biggest food fight you will ever take part in surrounds you. 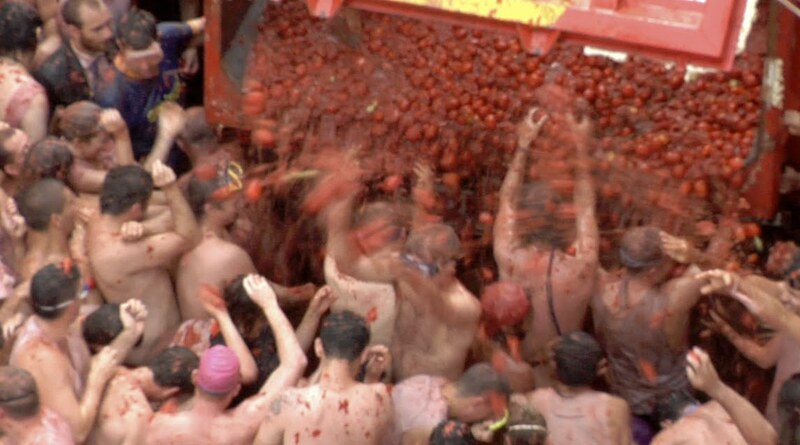 The greased pole and ham go up around 10am and the tomato fight starts at 11am however people start gathering in the city and getting on trains from Valencia around 6am. The train I was on that morning was packed, with people in the aisles and on top of each other at 6:45am. You will be covered head to toe in tomatoes and water, DO NOT wear flip flops or sandals of any kind unless they secure tightly with lots of straps or Velcro otherwise you will loose them within minutes and your feet will get stepped on. (Also be sure to wear something that you will be comfortable in as it could be a long day). If possible try to wear clothes and shoes that you might never wear again. I wore sneakers that immediately headed to the trash afterwards. If you are male you will most likely have your shirt ripped off of you if you don’t remove it yourself. If you are female sadly you may fall victim to this as well, so layer up if you can, I wore a t-shirt over a tank top over my bathing suit and gladly kept everything on. There are groups of people though that think its funny to rip other peoples shirts off, so be warned. The crowd of people will be the tightest most claustrophobic crowd you have ever been in, way more extreme than any concert you have ever attended. If you see an opening in the crowd, do not head towards it as most likely that is where the people are ripping other peoples shirts off and there is an opening in the crowd because people are trying to avoid the area. I hope these tips don’t scare you off, but just prepare you and allow you to have a wicked time! 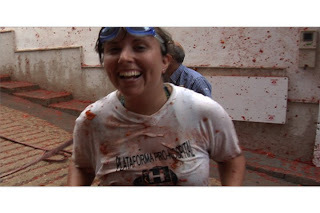 And while you are here why not check out the trailer for my Travel TV show where I visit Spain and attend La Tomatina!? Stay tuned for more videos soon! I don't know why, but this is exactly the kind of wacky cultural event I'm attracted to! How bizarre, but fun. I live in Japan, so I'm hoping to make it to one of the mud-flinging festivals they have here. this sounds awesome! must add this to the bucket list! Yay! Can't wait until tomorrow! It's going to be so fun. 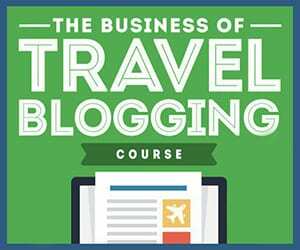 Great tips, will definitely be following all of them diligently :) wish you were here with us this year!! Great tips – thank you! I'm glad I picked up a $3 tee shirt yesterday. Excellent advice about the shoes – I was planning on flip flops, but that seems like a bad idea based on what you experienced. We're very lucky to have a bus that will hold our stuff (including a change of clothes), so that helps a lot.